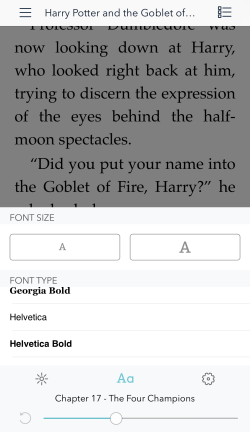 You can adjust the font size for ebooks in the OverDrive app using the steps below. Note: If you'd like to enable dyslexic font in the OverDrive app, please see this help article instead. Open an ebook from your app Bookshelf. Tap or click the middle of the screen to open the reader options. Select Font size, then pick the one you like. Tap the middle of the screen to open the reader options. Use the Font size buttons to adjust the size of the text. Tap or click the center of the screen to open the reader options. Select the Settings button from the bottom-right corner of the screen. 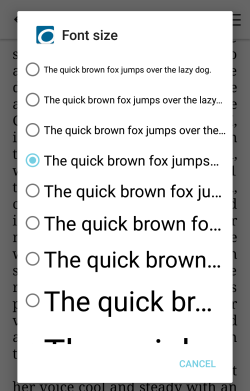 Select the Font size drop-down menu and pick the one you like.